The small bold color square pattern fabric is all about what Robert Lewis dress shirts are all about. Style is made easy when you put Robert Lewis brand dress shirts on your list. These bold all cotton dress shirts are worn be men who know all about style with these great looking designs made to get you noticed when you go out at night. 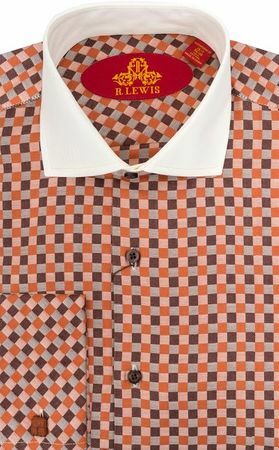 This orange mini square pattern dress shirt features a white collar and french cuffs. Made of 100% cotton fabric.